If you are looking for products that can help you maintain the deep luster and vivid colors that your natural or engineered stone has, you can check out this product list. Additionally, these products can be used together to create a stone maintenance program that will keep your stone surfaces looking their best. So what kind of maintenance program do we recommend? That will be affected by what kind of stone you have. For natural stones, we recommend you read this article on how to take care of natural stone. If you have engineered stone, any of the maintenance that is mentioned in the granite portion of that article can be used for engineered stone as well. Keep your quartz surface looking its best by cleaning and polishing it with this maintenance kit with cleaner and polish. 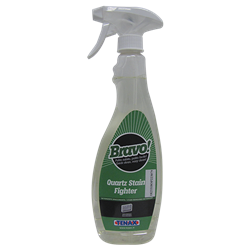 Aerosol polishing spray designed to provide protection against stains and spills. Brings out brilliant colors in the quartz. Streak free quartz cleaner removes film from Cambria, Silestone, Caesarstone and other quartz.